If I’m being honest with myself, I indulged in way too much sugar and treats over the holidays (using my nursing-a-baby appetite as an excuse), and now I’m reminded of how challenging it can be to reign-in my sweet tooth again. Why is it so easy to slip into bad habits, and so much more challenging to get back into healthier habits again? Ugh. 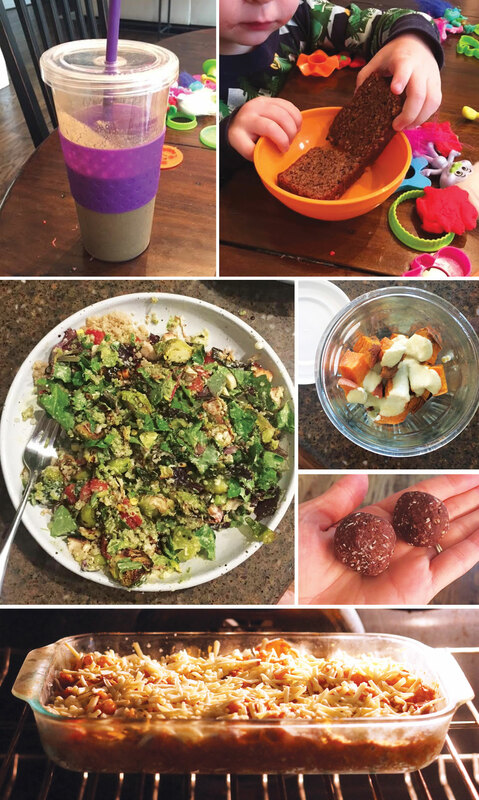 To help ease myself into healthier habits again, I’ve been following the 3-Week Bonus Meal Plan with the support of our new online Facebook community. (If you haven’t joined yet, you can request to join here— it’s free.) I love having the accountability and motivation of a group! We’ve also been doing the free Physique 57 workouts together, and I can’t believe how sore I am… even if I only have time for 10 minutes at a time. I’m not being too strict on myself at this point, but I’m already starting to feel better just easing out of the sugar-fog I was in. I’m not gonna lie, there’s still a big stash of Almond Butter Blondies in my freezer that I will pick at every now and then, but it’s still a step up from what I was doing. Progress, not perfect, right? Here’s a peek at how it’s going lately. Morning: My husband is still obsessed with our favorite chocolate shake, so we have it at least 3 times a week. (Recipe is in the first preorder bonus.) My son doesn’t like chocolate right now, so I’ve been making two smoothies most days, to give him something fruitier. He loves the Strawberry Basil Blast (from Everyday Detox) this week. Lunch: Not surprisingly, I made the Roasted Vegetable Quinoa Bowls for lunch– almost everyday for the last couple of weeks! I’m obsessed. I thought I’d show you what they look like after I chop them up because they’re not as pretty, but they taste better when they’re all mixed up. Reader Feedback: What are YOU eating this week? Your recipes are fab! Just ordered your cookbook. I see a chocolate cake in my future! Thanks for your amazing efforts! omg i do use your website and book often and i did not know you have a new book. Purchased!! thanks and have a lovely day!! chocolate cake will be made this coming saturday. Dear, I did purchase your book on my iPad, but I can’t find the chocolate cake recipe. Could you guide me? Thanks….btw looks delicious and I would love to make it! 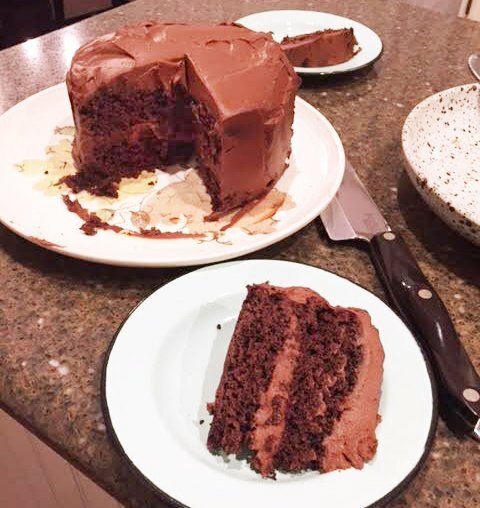 I’m not sure if the iPad version has page numbers or not, but the Vegan Chocolate Cake is found on page 166 in the book– in Chapter 8: Sweet Treats. Hope that helps! Megan, thanks for your feedback. I just would like to tell you, the vegan chocolate cake is not there and the iPad version has numbers, but page 166 direct me to hemp dressing and I did look chapter 8 and it is not listed there. Every time that I have guests for dinner always I make one of your desserts and everybody loooooooooooves! Is it possible that you’re looking through my first book, Everyday Detox? (My first book has a hemp seed dressing.) The Vegan Chocolate Cake is in my second book, No Excuses Detox. Thanks; I hope you love it!! Just wondering what recipe is used to make that chocolate cake… The icing on it looks divine! Are there any gluten free recipes in your new cookbook? Yes, both of my books are 100% gluten-free!